1. Preheat the oven to 200°C, gas mark 6. Toss the sweet potato with 1 tbsp olive oil on a large baking sheet. Season and roast for 30 minutes, until golden; set aside. 2. Combine the mustard and vinegar. Season, then whisk in the remaining 3 tbsp oil and 1 tbsp water. 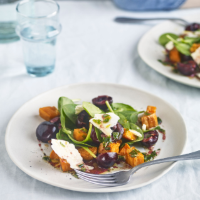 Stir in any juice from the cherries, then toss with the tarragon, spinach and sweet potato. Divide between plates and scatter with the cherries and sliced wensleydale. This recipe was first published in Thu Jun 01 11:14:00 BST 2017.